I hate to admit I'm graduating with both student loan and credit card debt. How can I manage these debts? Graduating college students are all asking this question. Your credit and financial independence hang in the balance when you graduate with both credit card and student loan debt. We have specific advice on managing these 2 very different types of debt, since it's all in the numbers. You are not facing this problem alone. According to a CNN Money report the average graduating student carried a debt of $35,200. With a sum of that magnitude, it is important to make a plan for paying it off, including a decision on which one to tackle first, student loan or credit card. It's crucial that you stay current on both debts. You can make the effort to pay one off quicker, but it is essential to make at least minimum repayments on both. The reason is your credit score, which is calculated on your ability to pay bills on time. As much as 35% of your FICO score comes from your payment history, so the only way to maintain that is to pay at least the minimum by the due date. A good credit score is essential for getting better rates on loans and insurance policies. Guaranteed, it will be checked and can make a big difference when you apply for your first apartment. Now, which one should you prioritize when trying to pay down your total debt? The credit card because it carries a higher interest rate on what is owed. According to industry sources, the average U.S. credit card interest rate for 2017 has increased to a record high of 15.59%. By comparison, the average interest rates for student loans is less than half of this. Paying off your credit card before your student loan will save you bucks on interest payments. Watching your statement is another way to avoid incorrect and excess charges. 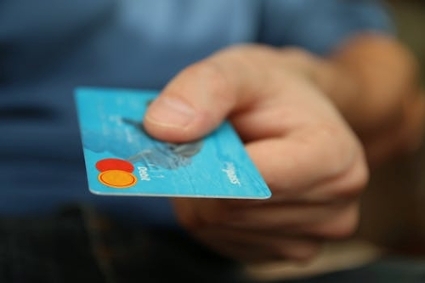 Be familiar with chargeback procedures to protect your rights with the credit card company. Going back to your credit score, 30% of it is determined by amounts that you owe, which goes towards calculating your credit utilization ratio. This figure compares what you owe to your credit limit, so it is best to keep it below 30%. Student loans however do not count towards this ratio. A high student debt will not damage your credit score but a high credit card debt will. Next, stop using your credit cards. If you have more than one, focus on paying the one with the highest interest rate. You do have the option of deferring a loan and paying it at a later time, but the interest is still likely to accrue, so avoid this if you can. Life was a lot simpler when what we honored was father and mother rather than all major credit cards - Robert Orben.